Leila Hatami. Peyman Moadi. Shahab Hosseini Sareh. Bayat Sabrina Farhadi. Babak Karimi. Ali-asghar Shahbazi Shirin. Merila Zarei. Recommended. Berlin Golden Bear Winner. Art House. 01 Ade tastics. Drama. 01 Adam's Faves. Oscar (Best Foreign Language). 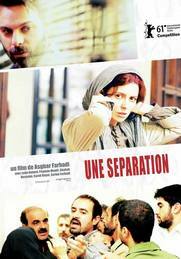 The stand out film of the 2011 Berlin Film Festival and winner of the Golden Bear, A Separation is a suspenseful and intelligent drama detailing the fractures and tensions at the heart of Iranian society, but using the disintegration of a marriage as the pivot by which all turns. When his wife leaves him Nadar hires a maid to help him with his ailing father, but the young woman has many secrets and soon he finds himself trapped by a web of deceit, manipulation and then all too public confrontations.